The New Year is upon us, and opportunity knocks. With a growing awareness of how FDA approved surface wipes kill harmful germs as well as an understanding about the key differences between personal wipes and commercial surface wipes, facilities across the U.S. ranging from gyms to supermarkets to health care facilities are increasingly using wipe dispensers and surface wipes to reduce cross-contamination and the spread of bacteria. They have the added benefit of inhibiting the growth of mold and mildew too, which can cause odors that are bad for business. Whereas in the past, sprays were commonly used (and sometimes ‘personal’ wipes) to clean surfaces with paper towels, the industry has adopted a new philosophy: keep all surfaces clean and hygienic by killing germs at their source i.e. on surfaces, before they can spread. If you are a JanSan dealer, you should know that it’s not just the Facility Managers or owners who are driving demand; it is the users, in many cases who expect to see disinfectant surface wipes available in plain sight and within reach. If you are questioning the opportunity in this space, look at a few statistics for gyms and supermarkets, both of which need your help! That means an est. 13% of all American are members of a gym. The gym market is a strong niche to develop because cleanliness and sanitization are important differentiators for gyms. There are a lot of gyms to service, and many of them are franchises in multiple locations! Other sectors also show a large market size potential. For example, according to Google, there are over 36,536 grocery stores in the U.S. alone. The Food Market Institute (FMI) reports that there are 37, 716 supermarkets (source: http://www.fmi.org/research-resources/supermarket-facts). Between gyms and supermarkets, there are thousands of companies to potentially contact. 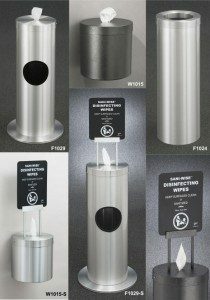 If you are interested in learning more about surface wipe products to use in these facilities, visit: https://glaro.com/antibacterial-wipes-dispensers/.